Bond ETFs and open-end bond mutual funds sound conservative in marketing materials, but they pack special risks & surprises in a downturn that can entail a catastrophic loss for investors. Exchange-traded bond funds and bond mutual funds are big business. They’re a lot easier for retail investors to buy and sell than the actual bonds, particularly bond ETFs, which trade on stock markets just like stocks — and can even be day-traded. But this liquidity for investors is precisely the potentially catastrophic problem. And in this era of rising interest rates and deteriorating credit, bonds already have plenty of other problems. Corporate America carries record amounts of debt. Part of this debt is in form of bonds (the other part is in form of loans). The amount of bonds outstanding has ballooned over the past five years, even as the credit quality has deteriorated. Now there are $6.1 trillion of investment-grade US-corporate bonds outstanding, according to Moody’s (plus over $1.2 trillion of “junk bonds”). These bonds are everywhere, including in bond ETFs and bond mutual funds, and therefore in retail investors’ portfolios. 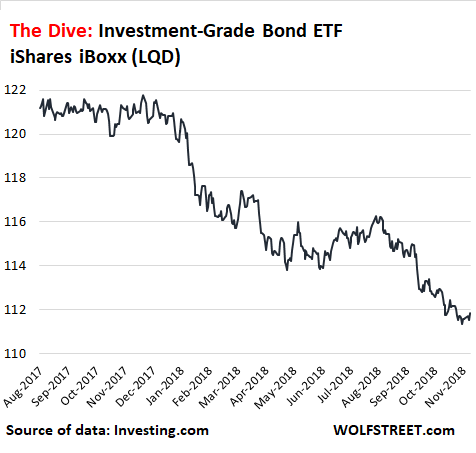 So as an example, let’s look at the largest, most diversified investment-grade bond ETF, the iShares iBoxx [LQD], with $30.5 billion in assets. It currently has a trailing 12-month yield of 3.25% and a “30-day SEC yield” (explanation) of 4.4%. Tempting, right? Investment-grade corporate bonds are all those rated from BBB- to AAA. Speculative or “junk-rated” bonds are rated BB+ and below, down to D for “default” (here is my cheat sheet for the bond rating scales used by Moody’s, S&P, and Fitch). Banks dominate the fund, accounting for 27.5% of the bonds in this ETF. So let’s hope that banks don’t start wobbling again. But that’s not the Big Worry. The Big Worry with bond ETFs and open-end bond mutual funds is the “liquidity mismatch,” which, if a “run on the fund” occurs, can lead to a catastrophic loss for investors. When the market gets stressed, a large number of investors can sell these bond ETFs at the spur of the moment to get their money out. When enough investors sell their bond fund, that fund would be forced to sell some of the bonds it holds. Even during relatively liquid moments, corporate bonds cannot be sold quickly. And during times of stress, liquidity can dry up, and the only buyers left may be some hedge funds bidding cents on the dollar. This might be OK for a while, as the ETF can unload the most liquid bonds first, such as Treasury securities it holds for that purpose along with some of the more liquid corporate bonds. And during a normal bond sell-off, that’s good enough. But if markets get rougher, and as bond prices decline more sharply, investors get nervous and start getting out of bond funds in general. And getting out of a bond ETF is the easiest because it can be sold like stocks. And these bond ETFs (along with open-end bond mutual funds that experience a run) are then forced to sell corporate bonds into a market with little liquidity and falling prices. As a result, the price of these bond ETFs will fall by a lot. Investors who own the bonds outright collect their coupon payments and, if the company doesn’t default, will get their money back when the bond matures. These investors can sit out the panic. But bond ETF holders and bond mutual-fund holders may get crushed. The fund is forced to sell those bonds at the worst possible time to hedge funds and private equity firms just waiting for this moment, for cents on the dollar. Then, when the market recovers, the ETF cannot participate in the recovery of the bonds it was forced to sell, and there won’t be much of a recovery for ETF holders. The loss will be permanent. And just the fear of this event happening can cause a “run on the fund,” when investors try to use the “first-mover advantage” (FMA) and bail out. It can cause a bond fund to collapse. This is the worst-case scenario for bond-fund investors. The likelihood that it occurs is small – until it isn’t. A number of bond funds collapsed during the Financial Crisis, such as Charles Schwab’s $13-billion bond fund SWYSX. And at least one bond fund collapsed during the Oil Bust in December 2015. When this type of collapse occurs, however small the chance, it’s catastrophic for investors. It’s the risk of losing a large part or most of your principal, despite the high-grade bonds in the fund, most of which will get through the rough spot just fine. Fund investors are never paid to take this risk. Then there is another problem with a much higher likelihood of occurring – in fact, it’s nearly guaranteed to occur over the next year or two, though the consequences are not nearly as catastrophic as a run on the fund. It affects all bondholders, directly and indirectly. And in the end, it could contribute to triggering a run on one or the other fund. Thus, from the perspective of dollar amounts outstanding, the U.S. investment-grade corporate bond market is now riskier than it was prior to each recession since 1981 and possibly all prior downturns through the late 1940s. As financial conditions tighten and interest rates rise, refinancing maturing debt gets more difficult and more expensive for junk-rated companies. Those that cannot roll over their maturing debt will default. A slowdown in the economy causes further deterioration of their cash flows — they’re junk-rated because they already have too much debt for the amount of cash they generate — which will cause a slew of them to be unable to even make interest payments; and they too will default on their bonds. And many of the $2.8 trillion of BBB-rated bonds, now safely tucked away in investment-grade bond funds, are facing that fate. So, there is a lot to think about when investing in these super-convenient and conservative-sounding bond funds during these times of rising interest rates, with a down-turn lurking somewhere in the future, as the credit cycle has already turned south, and as losses are already piling up, though these are still the good times. Purely hypothetically, could a struggling Company suruptitiously put money aside so that when their bonds collapse (with the Companies doom laden predictions) they could then instruct their brokers to buy the bonds back in at a much lower price. In due course buying back in at under “100” would eventually turn into a “profit” for the Company. What you are referring to are a particular type of bonds called “callable bonds”: basically they are like ordinary bonds, but give the issuer the option of redeeming the bonds at some point before they reach maturity. These bonds are not really “bought back” and held by the issuer to maturity but to all effects cancelled immediately. These bonds are called (at a slight premium to par, usually defined in the contract) when interest rates go down. The same contract often includes a mechanism called “call protection”, meaning a fixed duration during which bonds cannot be called, thus ensuring bondholders get a minimum yield. Another mechanism is “extraordinary redemption”, which allow the issuer to call the bonds only, and if only, some very specific conditions are met. Generally speaking callable bonds carry a higher interest rate than similarly rate bonds because the prospective bondholder is facing an extra risk, namely the potential loss of his fixed yield well before the bonds are due, and at a time when he’ll be forced to rely on lower fixed yield. I remember this was being done during the financial crisis but I can’t remember who was doing it. Danish home owners with long duration fixed rates mortgages. ;). The bonds making up most danish mortgages are callable and traded in the market so it’s the sports here to convert ones mortgage whenever interest rates are doing something. The other way it was done during the 2008-2009 crisis was for banks to mark down their bonds (liability on their asset sheet) to market price, and thus appear to have a stronger balance sheet than they did. “Why is your company sound?” “Because the market thinks our bonds are only worth half price!” It was total nonsense!! There is something called a “debt exchange,” where a company threatens its bondholders with bankruptcy, and those bonds then trade for 30 cents on the dollar or so. Then the company offers to exchange those bonds for new bonds at a haircut for bondholders and better terms for the company. This lowers the company’s debt. Many bondholders voluntarily agree to those kinds of debt exchanges if the gun held to their head is big enough. Ratings agencies consider this debt restructuring a form of default. This was done aggressively during the last oil bust (2015-16). They could also short bonds in the open market, much as a futures trader hedges his crop. Unlike individual bonds, bond funds charge fees and are vulnerable to fluctuations of the value of dividend payments. An individual bond has it’s total issue price returned upon maturity, providing the issuer does not go bankrupt. But lots of ways around that as discussed. Purely hypothetically, that looks a lot like fraud. More to the point, I can’t imagine the management of such a Company doing this on the Company’s behalf. I _could_ imagine some of these guys having, say, their brother-in-law set up an account which would be instructed to buy the bonds when they fall below BBB. Does the SEC still prosecute this sort of thing? I’m not sure. . .
Ira Rennert and Donald Trump, among others did this.- Michael Milken advised this strategy during the 1980’s. He knew that pension funds and insurance companies would dump the bonds on downgrades – and he had other accounts to scoop them up, sell them back to the previous issuers. This is at the heart of Glass-Steagall, the break-up of commercial banks and investment banks, which was dismantled by Gramm-Leach-Bliley in 1999. Citi-Solomon-Travelers. It took collusion to circumvent Glass-Steagall, now it can be done legally. Thru the use of special purpose financing corp. and hybrid stock-like instruments, Enron took down their own shareholders. And 6 years later Bear/Lehman/Countrywide/ FNMA etc were taken down by an exception to the Enron Rules available only to financial institutions. Believe it or NOT- and you will never see a book or a movie that explains this. Sad-jusy sad! in the words of Trump. Companies cannot hide off balance sheet assets for rainy days when their fortunes crash because they owe it to their shareholders to maintain their balance sheet according to the laws of the jungle & survival. Hiding assets from shareholders off-balance sheet is pure sleaze and the kind of behaviour that evidenced The Gorilla of Wall Street begging for help before he was Chapter 11nd to the netherworlds away from bulge bracket investment titans like all the other scumbags he used to work with down Wall Street’s so-called ‘Investment Houses’ which are nothing of the sort and are merely really freaking BIG Hedge Funds that are called Bank Holding Companies. When this all blows up I am taking over, dammit. You probably meant the most percentage drop during one year since 2011? Per stockcharts LQD closed 2011 at around 90 and now is at around 111. But yeah, doors will be too small and too few, when every one will want to exit. I think this is one of those issues of total-return vs. market-price-only data. StockCharts.com plots total return (adjusted prices). LQD investors are up about 35% since 2011 on a total-return basis, due to the bond-interest payouts, although the market share price is not up. Forgot to mention, as non subscriber i cant post actual stockcharts link, but if you click on (link i posted earlier) weekly chart and bellow chart sellect for bar value 1 you will see the chart starting sometime 2008 or 2007. Just as warning how unreliable some data is. I may stop using stockcharts alltogether. Former – StockCharts.com is a great service. I like it so much that I pay for a basic membership (about $200/year). This pays for itself given how I invest and/or trade. For me it’s a big plus that StockCharts.com plots Total Return (including dividends etc) for stocks and funds. As an investor I want total return! Not just price appreciation. Historical prices adjusted for dividends and splits can be found at finance.yahoo.com among other places. So Wolf is technically correct that an LQD investor who bought in 2011 for about $110/share can sell today for $110/share … but Wolf did not mention that that LQD investor also has another $35/share (roughly) in his account from the dividends. That’s always the problem with individual bonds: there is the yield, and there is the price. But your personal yield was edged in stone when you bought the bond at a certain price. If that yield was 5% for you because you bought at 100 cents on the dollar, and then the bond gets downgraded serially, and a year later, the current yield for prospective buyers is 10%, for you the yield off your investment (since you bought at 100), is still only 5% but if you try to sell the bond, you find out that the price has dropped. So when it comes to bond funds, you should look at the yield and you should look at the price separately. Principal and interest. Same with dividend stocks. Obviously, it doesn’t hurt to look at a total return chart. Same for the S&P 500. Wolf, you don’t think Powell’s speech yesterday indicates a major reversal? Wall Street certainly thinks so. His wording yesterday, that we are now “just below” neutral interest rates, is almost the opposite of what he said just a few weeks ago, when he indicated that rates were still far below neutral. To me, it looks like either he’s finally capitulated to Trump’s harangues, or he’s seen some new economic data that has shaken him off his course. 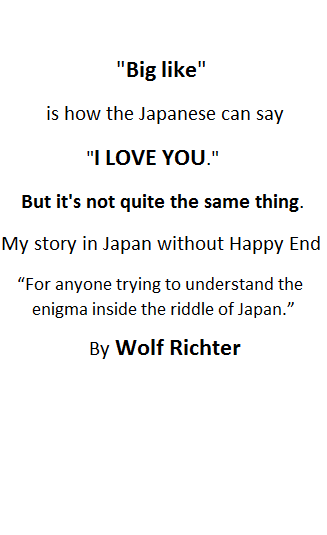 I can’t really think of another explanation for such an abrupt change of expressed sentiment in such a short time. You didn’t ask for it but I’ll give my two cents. Powell said we are near the bottom of the natural range, but he also said the range is broad, which gives him added flexibility to go higher on rates. I think the statements could be interpreted as dovish or hawkish only if you cherry pick, like Wall Street media likes to do to juice the market. Maybe this is why the 10 year didn’t move. There has been no data, aside from stock price drops, to indicate economic activity is in trouble. Some drop in economic activity is desired and expected as we progress to the natural rate. The activity that drops off is the harmful excess activity that creates systematic risk. I think it will take more than a modest drop in activity for the Fed to pause rate hikes. I get that he gave himself plenty of wiggle room. However, the wording does indicate a very deliberate change in sentiment. He had to know how that wording was going to be interpreted before he said it. If he’s so concerned about asset bubbles – and I believe he is – it’s strange to say something that you know full well is going to goose markets, at least temporarily. I don’t think it’s strange. The fed is trying engineer a gradual correction. So you don’t want wallstreet to overreact or underreact. So it makes since to ease some fears and try to temper the market reaction to further interest rate increases. If he remained 100% hawkish in tone I would think it’s likely that a snowball effect might take hold of investors overreacting. I heard one commentator say Powell was simply correcting a mistake. Last meeting he made an error in saying we were far from the natural rate. He’s just corrected that mistake. That’s plausible to me, but I don’t really care. The economy has moving way past its “natural speed” (evidenced by debt build up) on icy roads. I don’t see how the Fed can prevent it from fish-tailing with minor turns of the wheel. In my mind, the key issue is what the Fed and legislators do when she starts fish tailing. That will determine investing results more than anything, so I don’t want to lock into anything right now. I believe what you’re referring to is the newly created Powell put which follows closely in the steps of the Bernanke put. Whatever illusion of fed independence might have existed it’s all but impossible to maintain the charade when the fed capitulates so spectacularly to trumps incessant whining. 2 months ago “we’re a long way from neutral at this point, probably.”suddenly with nothing else changing but a tiny 10% drop in the market we’re st the bottom range. I’d be very comfortable taking a wager that we’ll see ZIRP again long before we see 5 or 6% fed rates in this country. And I think wall street knows it plus trump is staking his whole presidency on it too. I have seen some brokerage reports on what (and when) we will have neutral rates. Powell isn’t far off the dotplot numbers. Trump has nothing to do with it and the market has been building up to a rally for several days. Right now the overhang is geopolitical and energy. Do you see this as a potential risk for treasury ETFs too? I’m thinking of SHV, SHY, IEI, IEF, TLH, and TLT. The risk cited in the article is the forced selling of the UNDERLYING bonds within a fund if the ETF sees considerable selling.Bonds which are not as liquid will have a wider bid/ offer spread than those which are most liquid. The more liquid the bond , the less the risk that this will be much of a problem. There is more liquidity in short term bonds than longer term bonds. This applies to Treasuries also. So if a fund like SHY has to sell some of its underlying bonds ,there will be less impact than if a fund like TLT has to liquidate bonds.BUT as a whole, Treasuries are much more liquid than most bonds held in corporate bond funds. Rcohn – that’s what I was thinking, thanks for the response. A small amount of forced selling by ETF’ETNs holding bonds will depend on the OTC market for buyers. Thats the problem. I thought Powell’s whole demeanor was one of having been “taken to the woodshed”. His tone was one of capitulation. He looked like a deer in the headlights. This can’t be good. Hint…he did, he has, and he’ll continue to do trump and more importantly wall streets bidding. It feels like we are on a 1 one road to being Japan 2.0 and Zirp forever. That was my strong impression. Almost like he had decided he’d better throw the Whitehouse a bone before before the President’s constant criticisms start completely undermining his authority. Which, if true, means the President’s criticisms have done just that. You are assuming the Authorized Partners will act, and arbitrage the shares of the ETF. But what if they don’t? In a liquidity crisis, there is a substantial risk in buying up shares, turning them in to the sponsor in buckets, and receiving the underlying bonds to sell. If you read the fine print in the prospectus that nobody ever reads, you will find that the Authorized Partners do not have any obligation to arbitrage the ETF. They can all sit on their hands and do nothing. When that happens, the ETF can drop far below the NAV of the bonds. Your point is well made and is part of the inevitable problems of “short volatility”. I still fail to see how value of bond ETF can collapse beyond the value of the underlying bonds and how recovery in value of the underlying bonds does not reflect back to ETF. Could anyone explain this, please? The problem with a BBB downgrade is not an issuer default, the issuers may be doing just fine. The downgrade could come because the better grade bonds are deteriorating. Since most bond funds can only hold investment grade securities any downgraded BBB will have to be sold at whatever the market price is. The downward spiral will be HUGE. One way I think this could happen has to do with how pensions are dealt with in a big bankruptcy like Sears. If these companies are allowed to walk away from pension obligations, things could get really bad. I am not sure about the Sears portion but I had a K Mart pension. About 5 or 6 years ago we were offered a cash out option. I imagine that they cashed out the Sears side at the same time. The big problem maybe stock and bonds owned by employees through there 401k those people are going to be fleeced. Petunia I agree with you. If Moodys or S&P or Fitch put out a slew of rating downgrades (which inevitably happens during a period of market weakness), the “investment grade” funds will be forced to sell a large fraction of their holdings just when no one wants to buy junk bonds. This could then trigger the run-on-the-fund risk that Wolf outlined so clearly. Wolf, the content that you are providing is valuable and I don’t know where it is available anywhere else. Thank You! Wolf, this is an ignorant question on my part, but a serious one as based on your article I seem to have a bad misconception about how bond ETFs work. While I understand the potential liquidity issue for a “bond run” in a traditional bond mutual fund, I am a little confused about how the same issue applies to the bond fund ETFs. I thought the point of ETFs was they trade like stocks, so, unlike the mutual fund, when one sells ETF “shares” the fund doesn’t have to buy those shares because the “shares” are being sold to whatever investor will buy those shares on the open market as per stocks. I.e. just like when you sell stock shares it doesn’t automatically force a stock buy-back from the company who issued those shares, instead those shares are sold to whomever is buying. Thus as the ETF bond fund isn’t buying the ETF “shares” being sold (unless it wants to) the fund doesn’t need to raise any capital when the ETF “shares” are being sold off even en-mass, and so an ETF bond fund doesn’t need to liquidate any assets to cover the “bond run” on its ETF. Again, this is in contrast to the bond mutual funds, which do have to redeem investors directly when they want out, and thus are forced to heavily liquidate at-loss when their are mass redemption. Is this not how the bond ETFs work? If so why not? It seems like that would be the sane and safe way to run a bond ETF to prevent a liquidity crisis at the fund in the event of a bond run while simultaneously reducing the severity of a bond run by minimizing the impact of bond-crises on the viability of the fund itself by removing the selling into weakness feedback loop. Requiring all ETF sales to work via the equivalent of an enforced stock buy-back sounds like madness to me. Imagine if stocks worked that way, companies like GE would have gone insta-bust already in catastrophic runs finding themselves tens of billions of dollars in debt overnight and forced to sell off all their assets to cover the shortfall; instead despite GE’s poor financial situation and massive stock beating, GE is still alive and may actually turn things around (eventually,) while also having plenty of time to slowly pawn off assets if necessary to make up debt shortfalls and thus avoid an asset-sell-off-into-weakness-feedback-loop. ETFs are asset managers, similar to mutual funds. So the amount of assets they hold fluctuates with demand for the fund. There are differences between the two, including how investors buy and sell those shares. “Fund flows” is a closely watched metric, and bond ETFs have since fund outflows recently, which means they have to sell some of the bonds they hold. I discussed what the Authorized Partners might do in a comment above. Looking at this a different way – it’s true that ETF units need not be destroyed when an ETF is sold by an investor; it depends who the buyer is. But in that case the ETF price doesn’t necessarily track the price of the underlying bonds. When the underlying bonds sell off, creating overvaluation of the ETF, knowledgeable arbitrageurs will sell or short the ETF, buy the bonds, and profit from closing the spread. Conversely, if ETF sellers drive the ETF to undervaluation, the arb is to buy up the ETF and sell the underlying bonds – this is what the Authorized Partners of the ETF can do IF THEY WISH. But I think part of Wolf’s point is that “sell the underlying” may become impossible (at reasonable prices) due to the liquidity constraint of the bond market. Then the ETF investors face a fiendish problem – the ETF is down, even undervalued (they are sitting on losses) BUT the ETF holders (on the whole) cannot exit without even worse losses, since the bonds can’t be sold. So the bond price drops to match the ETF price instead of vice-versa. If the bond market starts to crash, the Fed will step in. If the stock market crashes, the Fed will step in. These are givens. The ramifications of those actions when they occur will not be risk free for the US dollar hegemony. Surely only ‘givens’ if the incidents you describe are in fact capable of being contained and controlled. What if it all happens so fast and furiously that they aren’t? Those computers are pretty quick at trading, y’know – and if the wealthy want the hell out of Dodge, it’ll be a tsunami. The government has strong control over the markets; much of it through computerized trading algos as well as manual intervention when needed. You are correct in that a massive sell-off would be difficult to contain and in that situation, they’d let the selling wash out and step in at the bottom and buy it back. This is what happened in 2009 and on. The government would not allow the markets to crash and stay crashed, period. It would throw the country into a massive depression. That all said, the only viable backstop if things get really bad, is more QE (announced or hidden or both) to buy the markets back up. This too will be done if necessary. We live in dangerous times. Our economy faces multiple structural vulnerabilities. (even in extreme circumstances) only purchased the highest rated bonds. Disclosure: expecting/trading fairly high chance that JNK (hyg) etf goes to/near zero, like xiv. you can without destroying the fund. Because the Trust Indenture of a ETN was created at the issuance of that Fund. It doesnt allow for this option without shareholder/ETN-holder approval. If that language – conversion to a different type of instument- were incorporated into the indenture, then I’d like to know it. What are the differences in a closed end bond fund? They have been overwhelming the market with supply for thirty years. The upshot is that rates must certainly go up when buyers demand higher yield, but the ratio of new issue to existing float implies the (larger) value of that group keeps yields lower, and anytime you overwhelm supply you get a bear market. Or why aren’t rates breaking out? Ambrose, in a closed-end fund, the number of shares in the fund is fixed and directly linked to the basket of bonds held by the fund. The fund’s value may diverge from that of the underlying, but those trading the fund are not forcing illiquid trades in the underlying bonds. A closed end fund provides a modicum of risk aversion? As Wolf says if you own the bonds you simply hold them to maturity, no problem. If the portfolio of bonds is unattractive relative to the current yield then sellers would take the share price down until it represented fair value. I think closed end funds are better when rates are high, which might be right now? Closed end funds of all types trade like any other stock or bond. The value of the closed end securities may trade above or below the net asset value of the fund. Unlike ETF’s there is no link between inflows and outflows ie buys and sells of the closed end securities on the share market and the holdings of the closed end funds. Some closed end funds will sell at a premium to their net asset value and others will sell at a discount. If you absolutely have to own stocks or bonds I rec looking at some of the well established closed end funds that have been around while. You can buy all sorts of funds that specialize in one sector or another or one area of the world. Lisa, thanks for the link. Unfortunately closed-end funds are not a panacea for investors either, since the expense ratios are quite high. The CEFA database includes only a handful of funds with expense ratios below 0.5%/year. Looks like a closed-end lightly-managed fund with low expenses could be a nice innovation for investors! Actually the Investment Rate at auctions are better. Just hold them to maturity. Govt Bond ETFs don’t make sense now. Treasuries are not even State taxable. 1) Treasury bond funds are much less vulnerable to these risks facing corporate bond funds, because the Treasury bond market is much more liquid, and downgrade risks are far lower. Treasuries in general are less complex instruments so a buyer doesn’t have to wade through the prospectus before making a purchase. 2) In general, corporate bond funds promise more yield than Treasuries, and this works out when companies are healthy – but that’s when stocks are rising, and in that case you’re better off owning the stocks, which outperform bonds. However, when stocks are falling in a bear market, the corporate bonds get downgraded and it’s Treasuries that get the flight-to-safety bid and tend to outperform. If the point of the bond portfolio is to balance out risks from the stock portfolio, a Treasury fund can be a better choice than a corporate fund. 3) Mutual funds aren’t just a “black box” that spits out fresh prices daily and an occasional cash payout. If you invest in a corporate bond fund, you are financing the activities of the corporations whose bonds are in the fund. As Wolf pointed out, the corporate bond funds are heavily invested in the largest banks and many of the same “Hall of Shame” mega-corporations that Wolf routinely lambastes on these pages. If you don’t want to support the activities of criminogenic too-big-to-fail banks or ginormous monopolistic corporations, you do NOT want to own corporate or total bond market funds. (Conversely, if you don’t want to finance the misbehavior of the Federal Government, don’t buy Treasuries…) Investing is often a case of choosing the lesser of various evils, but everyone should be aware as investors that they ARE supporting something with their money. To make a point even clearer, folks have to differentiate Fixed Income securities between Corporate versus Treasuries. (I won’t even touch Munis or Agencies here). While they are both called Bonds, they are not the same beasts. If anything, the corporate bond sector is the pariah of the bunch with most consisting of junk, or just one step above junk. I might add that the registered retirement bond funds (RRSP in Canada) are quite illiquid, and incur automatic tax withdrawal, so should be safe, I believe. Of course, the prices will drop with rising interest rates. I wonder, could we have a similar article about online banks, pioneered by ING, and funded by high-interest saving accounts? For some annoying reason, my SEP-IRA is in a Vanguard mutual fund account. For some reason, I thought that there would be mutual funds whereby Vanguard would purchase FedGov debt just for the yields, so I couldn’t figure how the hell there were negative returns… makes sense now. Thanks for another timely article on the Potemkin-village nature of the corporate debt markets, Wolf. If this reminds me of anything, it’s the CDO markets prior to the GFC, where most AAA-rated CDOs had just a thin sliver of AAA-rated debt as their top tranche. Per the above data, the investment-grade US corporate bond market currently comprises just 10% AAA and AA-rated debt, and these are more or less best-of-times ratings, a whole lot of that bottom-tier BBB stuff is gonna get downgraded to junk during the next major downturn. If just a bit over half off the BBB-rated stuff were to be downgraded to junk, all of a sudden one would be looking at an overall corporate bond market in which fully *half* the total issuance is junk! The second is to buy or hold enough shares to from a a “creation unit”.This is reserved for “authorized participants ” ,who are large firms and involves large bundles of the underlying securities held in the trust . “Authorized participants” are NOT REQUIRED to buy or sell shares in the ETF. They do so when it is advantageous to them. Problems can arise when there is a run on the shares of an ETF. This is because the “authorized participants will only buy when they feel that they can make a profit by selling the securities that they received when they redeemed their “creation units”.Now if some of the securities within the “creation units” are illiquid or hard to sell , then the total value of the securities that the “authorized participants” received when they redeemed their “creation units “could easily be lower than the NAV as the “authorized participants “sell all of the securities that they received when they redeemed their shares. So if there is a run on the shares,the bid/offer by the” authorized participants” will move wider .And the more illiquid the securities ,the wider this spread will be. Your analysis makes for an interesting theoretical outcome but it’s based on an eventuality that would require liquidity to dry up and we now live in a world of infinite liquidity. In theory the Amazon rain forest could become a desert, but I’m betting that won’t happen for a long time and the same holds true for central bank liquidity. There will never again be a liquidity crisis now that we have a buyer of bonds, at the ready with an infinite supply of monetary units, to buy any and all bonds that panicked retail investor may want to sell. You may counter that the Fed is not permitted to buy corporate bonds to which I say: oh really? Some would have said the same thing regarding MBS a decade ago. The danger with holding bonds is not liquidity risk but monetary (inflation) risk. Bonds are just another form of currency. a 3% yield on a bond is meaningless if inflation eventually runs at a thousand or million fold per year. Bernanke put us on the path to hyperinflation, all that remains is the spark so set off the panic. Powell, now terrified of popping Bernanke’s bubble or displeasing Trump, is all to eager to knock over the inflation domino in a desperate attempt to keep assets inflating. What caused Powell to change his mind about the neutral rate: a minor, garden variety stock market dip and Trump nagging him. So goes the dollar and so goes the empire – kiss those aircraft carriers goodbye. The fed is just another lackey of trump. Van, look up “flash crash” and then explain to me how you can possibly believe that liquidity is always and everywhere adequate. Many ETFs are thinly traded already; individual corporate bonds are even more thinly traded. Wolf highlights a real risk. The reality is we have a Minsky-type system, one in which stability breeds instability. Here, the longer liquidity appears to be adequate, the more securities and derivatives are created, which spreads the available liquidity ever thinner. Hidden risk builds up until a crisis point arrives. Loos like the days of gambling and getting lazy and fat on cheap, easy credit are coming to an end. Best roll up the sleeves and get back to making stuff. Interesting reading… Going to have to review my etf bonds. Apologies if it is already covered above but why is this just a etf bond issue, does the same not apply to share ETFs? Is it the illiquid nature of corp bonds that makes it so toxic? Sure, The same problems applies to share ETF’s. The difference is that bonds can be downgraded, creating an event horizon where the bonds are suddenly going from ‘Good (liquid)’ to ‘Bad (untradeable)’, whereas a stock moving to the pink-sheets is a continuous process and thus easier to get out under. People mentally expect ‘bonds’ to be a relatively stable and a “return of capital (although you may have to wait a few years, and maybe move to Mexico)”-investment. The stock market is generally very liquid, unlike the corporate bond market. So the liquidity mismatch doesn’t exist with an equity ETF. I seem to have a distance memory of Warren B questioning how liquid ETFs really are (hence asking the question). Could one approximate a corporate bond fund with a blend of 70% 5 year US treasuries and 30% stock index fund? I remember last year about at this time the short VIX etf blowing up. My bro had a nasty loss on that “for sure trade” that vaporized. Etf’s are passive investing and I keep reading how the hundreds of billions in these instruments will exacerbate selling to the downside. I trade index etf’s, they are liquid and safer and I rent them for a short period of time only. I wonder about Bond Mutual Funds. Some funds probably have fairly big unrealized profits. If the Bond Market tanks and they sell appreciated bonds to cover redemptions, won’t late-to-the-party investors get tax bills for capital gains even as their investment declines in value? That’s unlikely because every day, bond mutual funds adjust their bond prices to market to calculate NAV, so there should be no unrealized gains or losses. However, in the opposite direction, that was not the case with MBS in the bond funds that blew up during the Financial Crisis. MBS became illiquid and essentially stopped trading at normal prices, and prices plunged so far when they did trade, that bond bonds didn’t immediately react to the plunging MBS prices. So for a while, NAV didn’t reflect in how much trouble those bond funds were. This came out in the numerous law suits and class-action suits that followed. I guess you missed the recent FED statement that they’re just about done raising rates (they’re near neutral). December will be the last hike then it’s a pause. Bond prices will be rising in the US, given the inevitable collapse of the Chinese economy and all that entails.